Entrepreneurs think, do and inspire action. This celebrates the beginning of their legacy of their thought leadership. A true thought leader does not just know his thought leadership; he shows it, grows it and lives it. All great brands stand for something. It is imperative that you must focus on what you and your brand stand for. Ambiguity is the mother of apathy; likewise, clarity is the mother of connection. An ambiguous brand will breed apathy; whereas a brand focused on clarity of ‘is and is not’ will be successful in forging the right connections with the right target audience. The clarity of your uniqueness will differentiate your brand from me-toos, and create a compelling interest in your exclusive promise of value. The brand Richard Branson stands for adventure and risks; he has been crystal clear in his brand promise from day one and has changed naught. Today when you think of Branson, you think of these attributes because they are indeed the soul of his personal brand. So who heard that the tree thump in the middle of the rainforest? Not a single soul! Does it mean it did not make the thump? If you do not reach out to your target audience on a regular basis; or worse never reach out and communicate your brand, your thought leadership to them-do you cease of exist for them? Today, the showmanship of your brand is all about being constantly visible to your relevant target audience; it is about being constantly accessible to them and exemplifying your brand. The world is your stage; but your performance lives in their mind. The brand Shah Rukh Khan is a classic example of being there where you are! The brand SRK has beautifully captured the prime time real estate in our minds by being constantly visible to us, and more importantly living his brand, his soul which is all about being iconic. Brands aren’t built overnight; they are the result of your labor of love. Every powerful brand consistently works towards delivering superlative brand performance, every single time. Consistency in his brand performance is what immortalized Steve Jobs in the world of technology. The brand Jobs was, is and always will be celebrated for his consistency in delivering path breaking technology to the world. Remember, once a brand; one must consistently ‘be’ the brand. Clarity, constancy and consistency in your brand communication will build an invincible and credible personal Brand, YOU; and thus brand your reputation. Your brand is a promise; your credibility, its personification. The Brand Ratan Tata epitomizes the power of credibility of your personal brand in fostering your business empire; he is one of those rare icons who has personified his company as well as accentuated the corporate brand with the inimitable power of his personal brand. 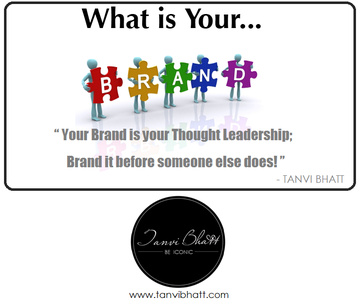 Brand your thought leadership today! It’s time to celebrate the Brand YOU today, so the world celebrates your brand tomorrow.